Summer is here and traditionally that means florals, and bright colours sweep the floors of every store and consequently your wardrobe. However, if youre not ready to give up fall and winter vibes, there might be a solution for you. 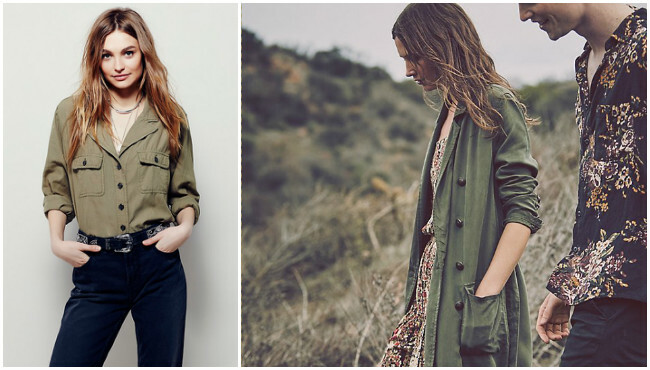 Spot all the army green, black and beige you need in Free Peoples Military trend. Take their usual feminine and bohemian style and infuse it with the rugged and intense elements of army inspired clothing. Complete with camo, surplus jackets and shorts. Our favourite looks of the collection? The long military jacket over a midi dress, and cargo pants paired with a sequin blazer!